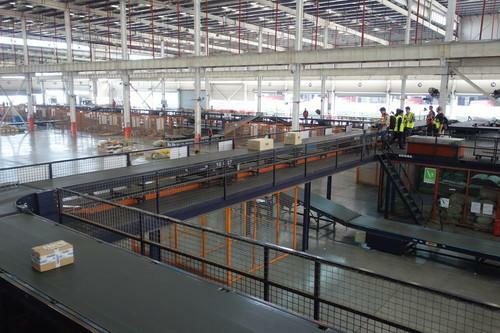 The packaging center at YTO Express. China is opening up its e-commerce market to more foreign investment, removing restrictions that limited investors to joint ventures with Chinese firms. The country's top IT regulator announced the change on Friday, months after authorities introduced it on a smaller scale for a newly established free-trade zone in Shanghai. The new regulation means that foreign investors can take 100 percent ownership of an e-commerce operation in the country. Before, China had limited foreign ownership to no more than 50 percent. China is opening the market as the government has been trying to stimulate more economic growth. To support the country's e-commerce development and increase competition, China wants to attract greater foreign investment and participation in the market, its Ministry of Industry and Information Technology said on Friday. A few foreign players have entered the market before, including Amazon.com and eBay, but none have managed to gain a huge following. Instead, the Chinese e-commerce sector has been largely dominated by local companies. Alibaba Group is the most prominent of them, and is still expanding by tapping smaller cities and rural areas of the country. Last year, it managed to sell a whopping US$9.3 billion in goods in a single day, during China's online shopping holiday. Amazon and eBay declined to comment on the new foreign investment rules in China. However, analysts have said the Chinese e-commerce market is still rife with intense competition, with both big and small local players all trying to grab a piece of the pie. JD.com, for instance, is another major online retailer in the country that operates like Amazon. But even with its rising revenue, JD.com is posting a net loss on the growing costs to expand and run its e-commerce business. Despite the competition, there's huge demand for foreign products in China. Both Alibaba and JD.com are striving to offer more imported goods. Earlier this month, Alibaba's founder Jack Ma spoke in New York, and called on U.S. small businesses to sell through its platform to reach Chinese customers.